Old Navy offers a variety of discount women's clothing in a variety of styles. Find our women's clothing sale items for less including tees and tanks, shirts, sweaters, activewear, jeans, capris, shorts, skirts, dresses, pants, loungewear and more. Our discount clothing for women is popular with women who love the flattering, fun styles from Old Navy. 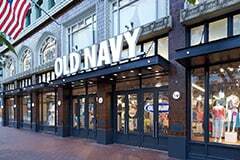 Find discount women's clothing at affordable prices from Old Navy.